Leiligheten "Le Logge" består av tre en-suite dobbelt / doble soverom med utsikt over hagen, alle med eget toalett / bad; det er en peis i både stort oppholdsrom med kjøkken-området og den elegante stuen; fra den vakre første etasje stue, takket være sin flotte glass galleri, kan man nyte panoramautsikt over hagen. I hjertet av det sjarmerende toscanske landskapet, blant de glatte åsene i Siena Chianti og duften av sine grønne vingårder, finner du Podere Lucignano Secondo Agriturismo, et herskapshus bygget i 1898, nå elegant restaurert og omgjort til en eksklusiv relais. Podere Lucignano Secondo Agriturismo, ideelt sted for elskere av avslapning og natur, samt mat og vin-kjennere, gir sine gjester en varm velkomst og en eksklusiv service. Villaen er delt i 2 leiligheter: leiligheten "Le Logge". Første etasje: 3 en-suite tvilling / dobbelt soverom hver med privat toalett / bad, 1 stue / spisestue med kjøkkenkrok og peis, 1 stue med peis. Første etasje: 1 stue åpner mot hagen, en terrasse, park, privat parkeringsplass. Den rustikke leiligheten "La Mangiatoia". Første etasje: 2 doble / doble soverom med 1 felles toalett / bad, 1 kjøkken, 1 stue / spisestue med peis, 1 terrasse, park, privat parkeringsplass. Van Transfer Service fra / til Flyplasser - Private Tour Driver Service. Tradisjonell toskansk middagsmeny: Det beste av toskansk mat "hjemmelaget", forberedt bare for deg i Villa. Regionale spesialiteter, lokale viner og et elegant belagt bord vil være ingrediensene til en kveld med autentisk italiensk stil. EUR 80 per person, varighet 3 timer, min 4 personer. Vinsmaking: Et utvalg av de beste toskanske viner, ledsaget av typisk ost, for å smake hyggelig i Villa. Fra rødvin Chianti Classico Gallo Nero til hvitvin Vernaccia di San Gimignano. En eksklusiv vinopplevelse, i salongen på Villaen. EUR 80 per person, varighet 2 timer, min 4 personer. Cooking Class: Lær det italienske kjøkkenet under ditt opphold i Chianti. Du vil kjenne de mest kjente italienske og toskanske oppskrifter og velsmakende. Matlagingskurs med middag inkludert. EUR 80 per person, varighet 3 timer, min 4 personer. I den elegante stuen er det to komfortable, store sofaer og en marmor og toskansk cotto peis. Den romslige stue / spisestue, komfortabel og elegant, er utstyrt med et kjøkken-området og en stor peis, som vil varme ettermiddags slappe av i liten sittegruppe, innredet med to komfortable lenestoler. Den Logge, definitivt den mest imponerende rommet i hele Villa, er en typisk første etasje forhallen i Alberese stein og toskansk cotto, forvandlet til en elegant stue som vender ut mot hagen. Den velholdte hagen som omgir villaen er rik på friske skyggefulle steder tilbys av høye, slanke furutrær. Rusler blant de gamle oliven, vil du nyte den naturlige duften av lavendel, salvie, rosmarin og mynte busker. Den brede Terrace i toskansk cotto, med utsikt over den grønne kanalen av den omkringliggende skogen, vil være den ideelle innstillingen for levende lys sommer middager. The Lawn av Villa er det perfekte stedet å slappe av mens du har et glass god vin. We loved our time in Lucignano 2 and particularly the large wood burning fireplaces. There were 2 but we were drawn to the one in the large country kitchen. We also enjoyed having an outdoor grill so we could do our own steak Florentine. In fact we had dinners at the Villa every night and explored the wineries, hill towns and Sienna. Our hosts were gracious and helpful. We very much enjoyed our stay and hope to return to this beautiful area again. Thank you Duccio for bringing us more wood! We just got home from a wonderful 10 days in Italy. When we planned our trip, we decided that we wanted a centrally located (in Tuscany) villa from which we could make short day trips. We mostly wanted to experience local Italian culture without spending much time in typical tourist areas. The Podere Lucignana Secondo was perfect for us! Duccio was there to take care of our every need. He gave us suggestions on restaurants and attractions, and every one of his suggestions ended up being wonderful. We met the rest of the family - Liliana, Enzo, and Max. The best thing about this villa is the privacy and the PEACE! It is away from any hustle and bustle. We sat out on the patio often - with wine and cheese - and just gazed at the vineyards and olive groves. We saw deer and pheasants across the way in the vineyard. So relaxing and centering. The villa was our headquarters, and from there we ventured out each day to explore different areas - San Gimignano, Montalcino, Florence, Siena, Radda in Chianti, Castella di Brolio - Ricasoli. In the mornings we'd drive into Pianella and enjoy cappuccino and pastries at the little market there. There is also plenty of room to stroll through the olive groves and along the driveway and up to the road. Really, I can't imagine a more perfect place to stay in Italy. In 2-3 years we hope to return and bring our children and grandchildren with us. We thank Carol and Ronald for choosing our Villa. They are "FIVE-STARS" Guests in all. We are waiting for Your next trip to Tuscany! Amazing is one word to describe this place. We were a family consisting of five adults and there was plenty of space to spread out and every bedroom had its own bathroom, which we all really like. The house was beautiful and decorated so nice. The owner greeted us when we arrived and was so helpful in telling us places to go and see as well as where the nearest stores were. There is so much outdoor space here as well. We took advantage of some nice mornings to have coffee outside and look over the vineyards. I highly recommend this place and can't wait to come back. We thank Laura and her group of friends: They were perfect Guests for our Villa. Thanks again! Everything we wanted this to be! Even better than the pictures! All I can say is “Wow!” This place was everything we hoped it would be and more! The hosts were wonderful and very helpful upon arrival and throughout our stay. The house is a wonderful respite and was the perfect end to our vacation in Italy. You will definitely need a car here and we were able to rent one upon arrival at the Firenze airport. Arriving was easy thanks to the directions provided! The location was great. We booked a winery tour for one day and the company picked us up at the house. You could also easily explore on your own, but bear in mind that Italian wine tastings are the complete opposite of wine tasting in the U.S. where the samples are measured by devices. In Italy, you may not want to drive to all the wineries. For food there is the small town of Pianella within 10 minutes driving from the house and there you will find a great pizzeria (Peposo) and a couple small markets for groceries. There is a large Coop store just outside Sienna which was a 22 minute drive from the house and easy to find if you want a more supermarket type store. We enjoyed every moment we spent here with our group of 6. If you have more you can rent the bottom level as well. If you were thinking of improvements to make, consider a hot tub with a sunset view and maybe a fire pit for sitting outdoors in the evening. We definitely hope to have the chance to return in the future and we will definitely stay here if we do! Five stars really isn't enough! This house is even more beautiful and relaxing than the pictures show. The views are stunning, on a clear night you can see the Milky Way! We had the top floor with 3 bedrooms/3 baths. Everything you need in the kitchen, plenty of room to spread out and relax, including another room on the first floor with the open glass doors. Many outdoor areas to enjoy the scenery. The attention to detail with this property is second to none. Owners were quick to respond with questions, and suggestions regarding the surrounding area and places to visit and eat. The property has been updated with all the amenities, but still have the character of the original farm house. You can rent the entire house for larger groups or families and it would be perfect. You really couldn't ask for more! 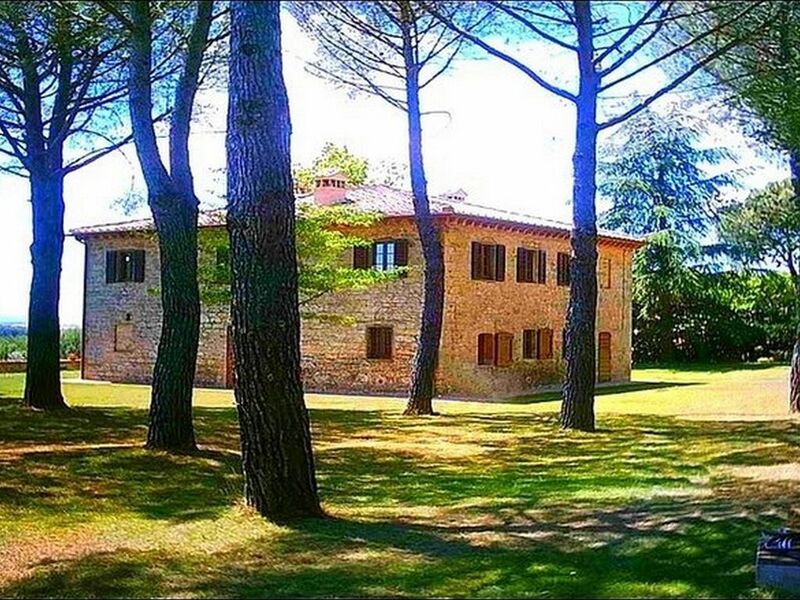 UTFLUKTER in Chianti: Hele området rundt Villa, i hjertet av Siena Chianti, er besatt med middelalderske landsbyer, kirker og slott, lett å komme til (noen av dem selv på foten). Sightseeingturer i BYER: Plasseringen av Villa er det ideelle utgangspunktet for kulturelle turer (selv én dag lange) av de viktigste toskanske byene. Trekking og SYKLING: For elskere av trekking og sykling er det et bredt utvalg av sjarmerende stier og hvite veier krysset tar pusten landskap. ART, museer, utstillinger: Den Provincia av Siena og alle Toscana har en rekke museer kjent over hele verden, hvor man kan finne hele året renessansen, Mediaeval, Ancient, etruskiske kunstverk. Videre veldig ofte, er moderne og samtidskunst utstillinger organisert i de største byene, alle lett å komme til med bil. Mediaeval TRADISJONER: I Provincia av Siena, som har en millenary historie, mye middelalderske tradisjoner er fortsatt i live: Palio i Siena, Bravìo delle Botti. MAT OG VIN: The Villa ligger i hjertet av Siena Chianti, en av de mest berømte dyrebare-vinproduserende områder i verden. Messer og markeder: Ukentlig Open-Air Market, alle onsdager, over 500 selgere fra overalt i Toscana samles i Siena, ca 15 km fra Villa: mange av dem selger kvinners sko og "Made in Italy" dameklær. SHOPPING: I ca 1 times kjøring fra Villa er det mange Outlet av prestisjefylte italienske Brands, hvor du kan kjøpe med rabatter opp til 60% sammenlignet med vanlige butikker. Outlet Val di Chiana Foiano (AR): Cavalli, Ferré, Laura Biagiotti, Versace. Outlet Montevarchi (AR) Loc. Levanella: Prada. Outlet Valdarno (FI) Loc. Leccio-Reggello: Gucci, Giorgio Armani, Ungaro, Valentino, Ferragamo. Outlet Rignano sull'Arno (FI): Fendi, Dolce & Gabbana.